Han river (or Hangang) is the major river flowing through the heart of Seoul. Indeed, spending a whole day exploring Han river is one of the most amazing things to do in Seoul. This river is an iconic symbol of the capital not just because of its beautiful scenery but also its historical value. If you find yourself enjoining a trip in Korea, it would be a shame if you miss this place. If you have not got any plans for exploring this tourist attraction, let our guide be your beacon. 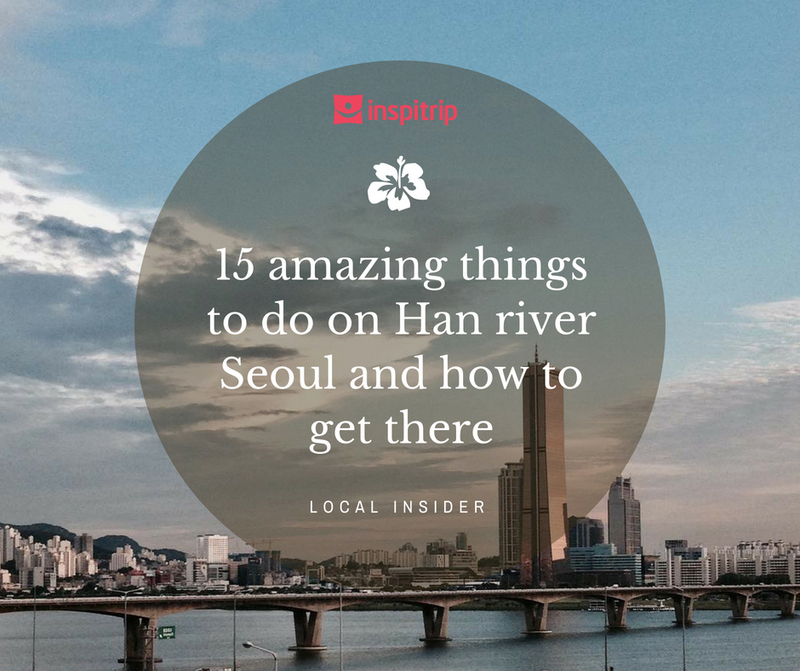 Here are 15 amazing things to do on Han river Seoul providing you the most fun, local experience. In order to prepare for your first windsurfing trip, you need to take a windsurfing class for beginners that lasts anywhere from 2-3 days. After finishing the preparation and mastering the skills necessary, you are able to surf on your own. This tour takes a shorter time to complete than windsurfing. During the 6 hour tour, you will learn about the theory of this sport to educate yourself, get some basic pointers from the instructor and the enjoy your adventure. If you do not have enough time for a kayaking tour, you can consider other choices including the banana boat, peanut boat, viper, or speedboat. Along the Han River, it’s easy to rent a boat for a sightseeing trip on the river. If you choose a swan paddle boat, you can enjoy the romantic, peaceful scenery while chatting with your friends. If you are looking for fun and thrilling watersports, these two are your perfect choice. Even if this is your first time trying these out, there’s nothing to worry about. A professional instructor will help you prepare everything you need and follow your trip to assist and keep you safe. After a training session, you will have two 15-minute rides with a 30-minute break between them. The activity will take you around 2 hours to finish. This sport is the best of the best on the list of water sports you can find on the Han River. 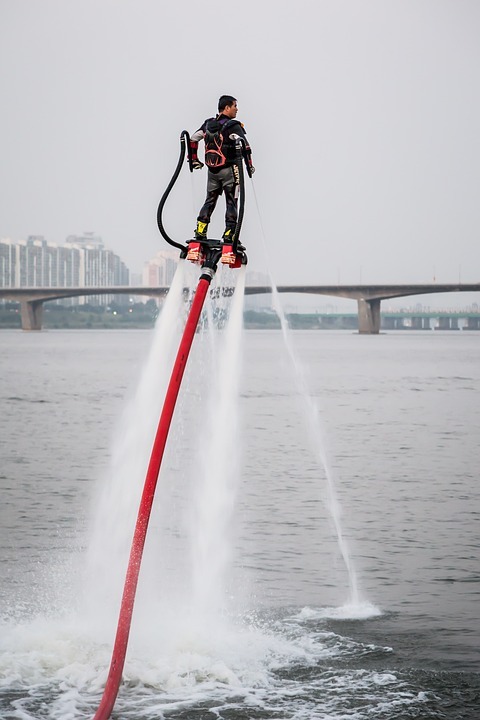 You will ride a flyboard and fly through the air like Iron Man. You’ll find yourself immersed in excitement while flying to the sky and surrounded by beautiful scenery with the mountain in the distance, the river below and the vast sky overhead. It is the most exciting activity among the things to do on the Han river. If you are not interested in the water sports and prefer the local experience, riding a bike on the riverside will meet your requirement. 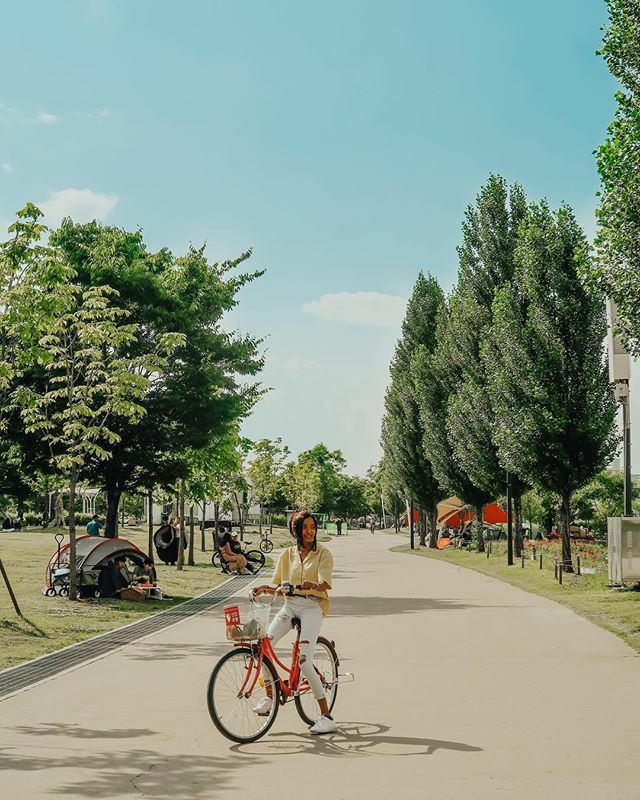 While visiting the Korea DMZ & JSA might frighten the faint-hearted, riding around Han river will help visitors indulge into the green nature and relaxation. The price for renting a bike here is around 3000 won (3$) per hour for a single bike and double that price for a tandem bike suitable for couples. Riding a bike provides you chance to explore beautiful corners around the river at your own pace since you can stop and sit on the grass whenever you want. Known as one of the top places to visit in South Korea, Han river enables visitors to engage in different interesting activities, especially camping in the style of South Koreans. 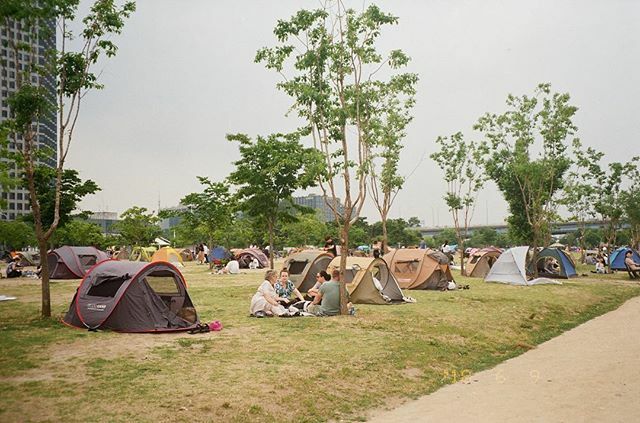 The only place that provides a camping area sitting on the edge of Han river is The Nanji Campground in Nanji Hangang Park near Worldcup Stadium. The campsite offers you all facilities that you need for camping such as tents, 24-hour-shower rooms, BBQ grills and other foods and drinks that you may need. Spending a night camping with your friends and having fun with a BBQ party will be an unforgettable experience. If you do not want to take part in the sports but just want to sit down and watch other people play, a picnic is perfect for you. There is much grass on the riverbank for you to enjoy your picnic. You can bring the food you packed to eat while chatting with your friends and watching other people play around. If you do not want to prepare the food, you can have food delivered. There are 10 different parks along Hangang riversides. Each of them provides various kinds of entertaining activities that will be introduced in this list. We highly recommend you choose the parks on the southern bank because of the beautiful view from there as well as the large number of entertainment activities that they offer. 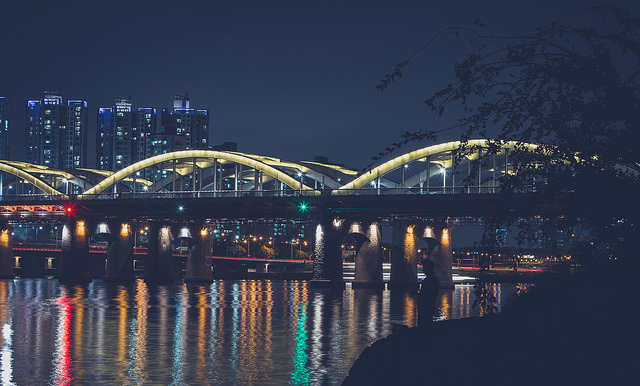 Ttukseom Hangang Park, Yeouido Hangang Park, Jamwon Hangang Park are three parks that you can find the exciting water sports on the list above. 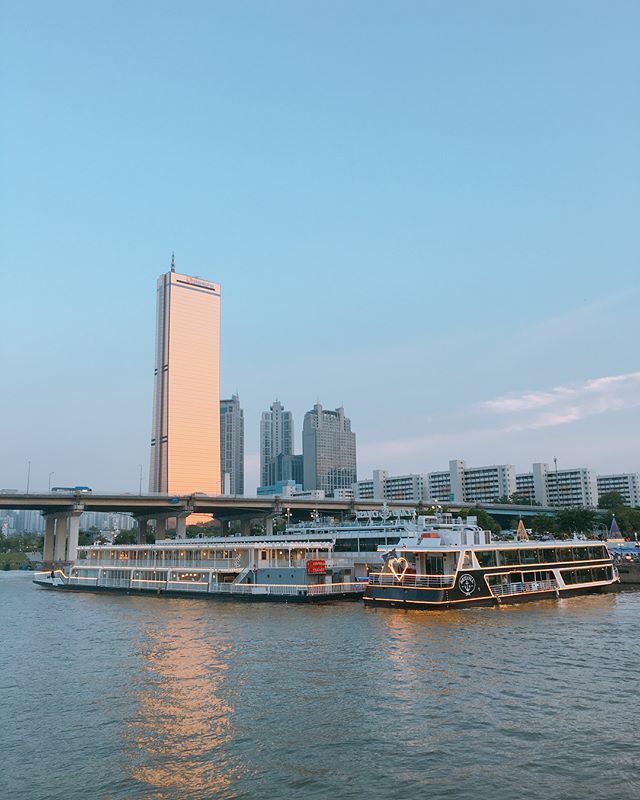 Of all the top things to do in Seoul, River Cruises are the best way to enjoy the Hangang river. The cruises are decorated in different themes according to the tourists’ interests. The cruises for children have colorful themes like pirates while other cruises can be in K-pop theme for the Hallyu fans. Spending time on the cruises, you can listen to music while having delicious Korean foods and admiring the scenery. This tour will definitely create a memorable experience for you and your family, friends or lover. Ramyeon is the Korean instant noodle sold in the convenience store by Han River. Ramyeon is sold in disposable foil bowls. You will put the noodle, spices and other ingredients that you love such as sausage, egg, cheese in the bowl and then let it boil. After 1-2 minutes, you will have a bowl of hot noodles to enjoy. This is an experience that you should not miss because you have the chance to cook a bowl of Ramyeon in Korean style for yourself. If you go to Korea in the winter, this will be a precious local experience that you must try. 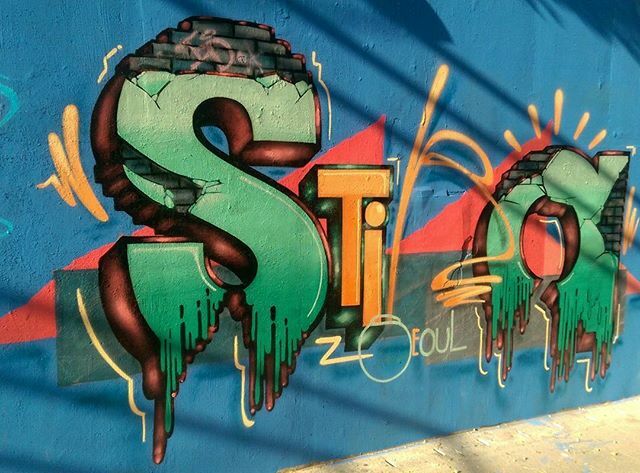 This is a tunnel connecting Apgujeong and Hangang River with graffiti on the wall. If you are interested in artwork and photography, the colorful creative spray paints here will definitely attract you. This tunnel will not take a lot of time to see. It is a short way to go to Hangang river if you want to stay away from the crowd especially on the weekend. 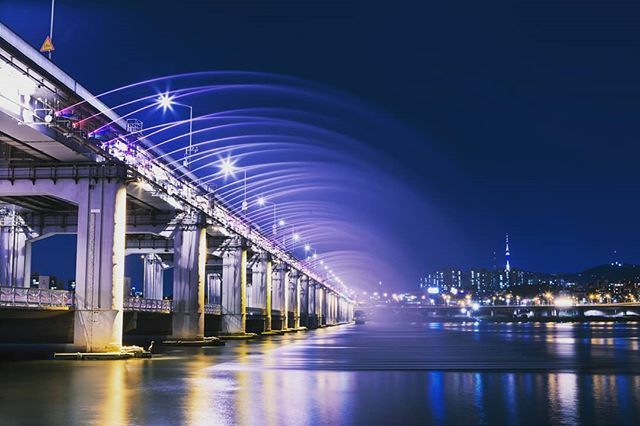 Banpo Rainbow Fountain is the longest fountain in the world, installed along the Banpodaegyo bridge with more than 10,000 lights on both sides. The nozzles spray water from the Hangang river, and are combined with the colorful lights and music to bring you a beautiful eye-catching performance. During the day, the performance will be shown without the decorated lights while the water is sprayed in shape of willow branches and willow leaves. After the sunset, the rainbow-colored lights dance to the rhythm of the music. There are few locations for fishing along the Han River inhabited by catfish and carp. In these fishing locations, you can find many fishers spending hours fishing while talking to each other. These places are very easy to access so if you want to get a different experience, find a rod and go fishing along the Han river. Along the Han River, lighting fireworks is allowed so feel free to light fireworks on your own. You can buy fireworks from Daiso shop and shoot it in the water for a sparkling view and lot of fun. Be careful and follow the instruction to keep you safe. If you have not lit fireworks before, ask for help from local people. 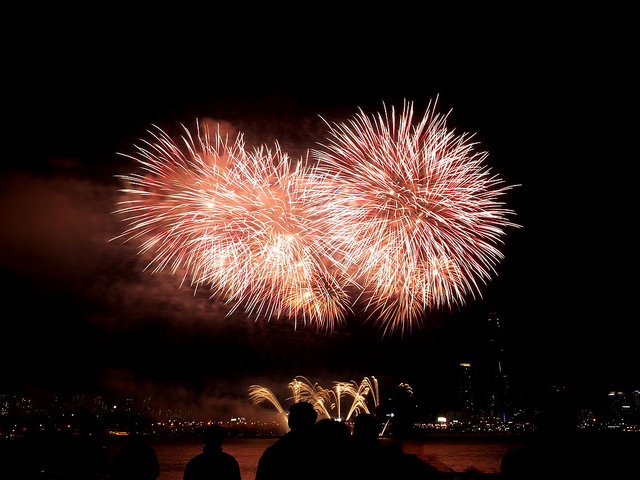 Seoul International Fireworks Festival is an annual event organized by the Hanhwa company attracting different countries to participate every year. Every year, many firework companies are invited to this festival to show their firework performance and light up the night of the city. The fireworks displayed to the resonance of music and lasers will bring you unforgettable memories. This festival attracts millions of viewers each year. Besides participating in the firework festival, do not miss other events following it. People are not allowed to swim in the Han River but you can still enjoy cool water in the swimming pools along the Hangang river provided by some companies. Each of them has a different style with different services that you may be interested in. Moreover, from these swimming pools, you can have a very beautiful view of the river. However, do not go there on the busy days because these swimming pools can get very crowded. Many activities above are done along the riverside, but tubester offers you a chance to really do something on the river. If picnics on the riverbank do not pique your interest, you can take your picnic on the river. Each tube-boat has enough space for 6 people with a big parasol protecting you from the sunshine. Having a picnic while surrounded by the beautiful scenery is so romantic and peaceful especially in the evening. If you want to immerse yourself in Korean culture, you must try their alcoholic drink. You may be familiar with Soju, (Korean wine made from rice) that is very popular around the world. You can drink Soju to have fun with your friends while going on a picnic or camping. There are different means of transportation to get to the Hangang river. If you are willing to have a local experience, the bus is suitable for you. Along the Hangang River, the bus stops are located near the parks so you need to choose which park you want to go first. After that, you will take the bus to go there because the buses to different parks have different routes. If your hotel is in Seoul, choose the blue buses (405, 740). Bus and subway may not be your choice if you are annoyed by crowds. Grabbing a taxi is also a convenient way to enjoy your trip. However, not many taxi drivers can speak English so if you do not know Korean, bring a map with you to show them your destination. You will not be bothered by other people and do not have to worry about the hustling crowd. It would be very convenient to rent a bike from your hotel and ride to the river. Pay attention to the signs of the cycling trail and get yourself a bike map. If you live near the Hangang river, you can walk there easily. Even if you are far from the river, walking is also good because you can stop and visit many places on the way there. In the afternoon, many people including the locals go there to exercise and jog, so feel free to join them!